For Women’s History Month, WIB-Southern California featured a fireside chat with Stephanie Hsieh, CEO of Meditope Biosciences, on March 28, 2019. The event was also a Town Hall meeting where representatives of all WIB committees spoke about what they do for WIB, how rewarding volunteering is, and how what they learn while volunteering can be useful for their careers. The event was sponsored by the law firm Latham & Watkins LLP and was held at their San Diego location. We started off with a networking reception with appetizers and delicious wine and beer, after which representatives from Latham & Watkins and our chapter sponsor, American Laboratory Trading (ALT), spoke about their companies. Julie Fishman introduced Stephanie and asked interesting questions about her winding career path. The common theme has been her courage to follow opportunities that piqued her interest, the connections she maintained throughout the years, and the support of her family. She finds change exciting, but recognizes the importance to gain transferable skills and, at the same time, be able to learn as you go. Entrepreneurship is somewhat in your blood, but you also need to force yourself to change or acquire necessary character traits; for Stephanie, these were shyness and persistence, respectively. Stephanie’s parents, whom she considers her mentors, wanted her to become a physician. Growing up, this is what she thought she would do, until an internship at Sloan Kettering Memorial Hospital while studying Biochemistry at Wellesley College made her change her mind. As she did not like the work in the hospital, but was not interested in a career as a scientist, either, her thesis advisor put her in contact with a patent attorney. This led to her decision to go to law school at Columbia University. Patent litigation sparked her interest in the business of biotechnology. Thus, she made the bold decision to give up a lofty salary and go back to school to earn an MBA from Stanford. She worked for a few years in commercial real estate until some friends from law school invited her to join their new patent litigation venture. Building the practice was interesting, but then the opportunity to join a biotech start-up presented itself. The operational role in this small company was very rewarding and gave her the experience to join another old friend when he called her up to say that he was up to something. Together they started Meditope Biosciences, an early stage biotechnology company that develops immuno-oncology therapeutics. 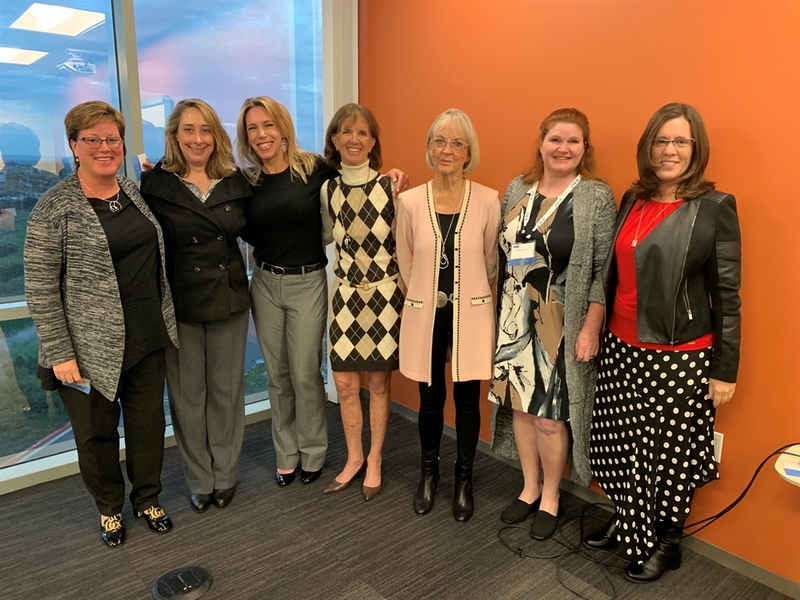 The February event of the Southern California chapter of Women In Bio focused on how to close the gap between research and clinical data is and how progress in this area can positively impact patients. The event was sponsored by our chapter sponsor, IQVIA, and was held at their facility in San Diego. As usual, the event started with a lively networking reception with delicious finger food, cheese and crackers, wine and soft drinks. More than 80 people came out to join the panel discussion. The upcoming chair of WIB SoCal, Katy McCowen, spoke about WIB and Linda Strause introduced the panelists. Tracy Dixon-Salazar, Ph.D., Director of Research and Strategy at LGS Foundation, shared a very personal story. She decided to get a Phd. in neurobiology and neuroscience to better understand and study Lennox-Gastaut Syndrome (LGS), a rare and severe form of childhood-onset epilepsy that affected her daughter. Dawn Barry co-founded approximately a year ago LunaDNA, a community-owned platform to securely store and share de-identified personal health information for health and quality of life research. The theme of genome research and personalized medicine continued with Anna Barker, Ph.D., co-director of Complex Adaptive Systems – Biomedicine, Director of the National Biomarker Development Alliance, and Professor at Arizona State University and Wendy Benson, Vice President, Strategic Initiatives at Rady Children’s Institute of Genomic Medicine. Rady’s launched a few months ago the Project Baby Bear, the first California state-funded program to offer whole genome sequence for critically-ill newborns hospitalized in intensive care units. Finally, Kelly Theel, Ph.D., Senior Regulatory Affairs Officer at IQVIA told the story of how the mother of a child with Tourette’s syndrome advocated with Congress to pass the Rare Disease Act in 2002 to incentivize companies to develop much-needed treatments for rare diseases. To read more, visit Dr. Roberta Alexander's Linkedin page here.